Do you love teaching yoga to children but find it hard to plan and come up with new ideas for every class? Wouldn't it be great if you had ready-to-use lesson plans and just enjoyed teaching kids yoga? Download Your FREE Unit Now! Are you a children's yoga teacher looking for new ideas to incorporate into your yoga classes? Are you a school teacher looking for creative ways to integrate yoga into your curriculum? Are you a parent looking for fun yoga practices and activities to do with your kids at home? Monthly Kids Yoga Units offer what you are looking for and provide you with tools and resources to bring your teaching yoga to children to a whole new level. Discover how! Being a yoga practitioner and a school teacher for over 20, years as well as a yoga and children’s yoga teacher for more than a decade, I’ve been doing yoga with kids everyday. During all these years I’ve taught thousands of yoga classes, yoga breaks, presentations, clubs and retreats to children. I’ve worked with many different ages and in a variety of settings, creating yoga lessons from two minutes to two hours. I’ve done all day yoga immersions for the whole school, presentations for parents and children, girl scouts, Montessori schools, summer camps, school clubs and many more different formats of introducing yoga to children. Every one of those classes required planning. And I’ve done it all! When I was just starting it took me hours to create a single yoga class. I needed to come up with a theme, possibly find a book, picture, a song or something else to engage the kids. Then I had to create a yoga pose sequence, pick a breathing exercise and write a script for a meditation to match my theme. Because I was teaching children I also needed to make it age-appropriate by including an art activity and games. If I wanted my yoga classes to be connected with my academic program I had to integrate it into a school curriculum. Being very passionate about kids yoga, I was planning, selecting, creating and writing almost every single day. I was happy to treat my students with a yoga class on a daily basis. As a result I’ve created many children’s yoga classes and other resources. Recently, after going through my many files, binders and boxes, I clearly saw that it’s time to share. I realized that by offering these resources to children’s yoga teachers, just like you, I can help them to be more efficient, more organized, professional, inspired and fun kids yoga teachers. And now, I am excited to make all these kids yoga lesson plans available to you! Let me tell you why a kids yoga unit works better than a random single lesson. When I just started to teach children’s yoga I was so excited about how many fun yoga classes I can create using an unlimited amount of themes and topics. So, this is what I did for a while. With time I noticed that while my students are having a great time in my yoga classes, they are not really remembering or learning much. It was puzzling. I was working so hard on planning the best classes I could, teaching them, putting my whole heart into it and still my classes didn't produce the results I was expecting. After much observation, analyzing and testing I finally figured it out. I wasn't what I taught in my classes or how I taught. It wasn’t the content, it was the structure of each class as well as the sequences of the classes. Though it was kids yoga lesson plans that I was working on, I used my teacher’s university education and years of experience to come up with the optimal lesson structure and then organize the individual lessons into monthly units to create an optimal learning experience for children. When I started to design and organize my classes using the new, scientifically proven method, everything changed. My students became true little yogis that knew the poses, breathing techniques as well as when and how to apply them outside of yoga classes. And this is what I want for you! I want to help you teach the best children’s yoga classes possible, using a proven method and planned-for-you children’s yoga lesson plans. 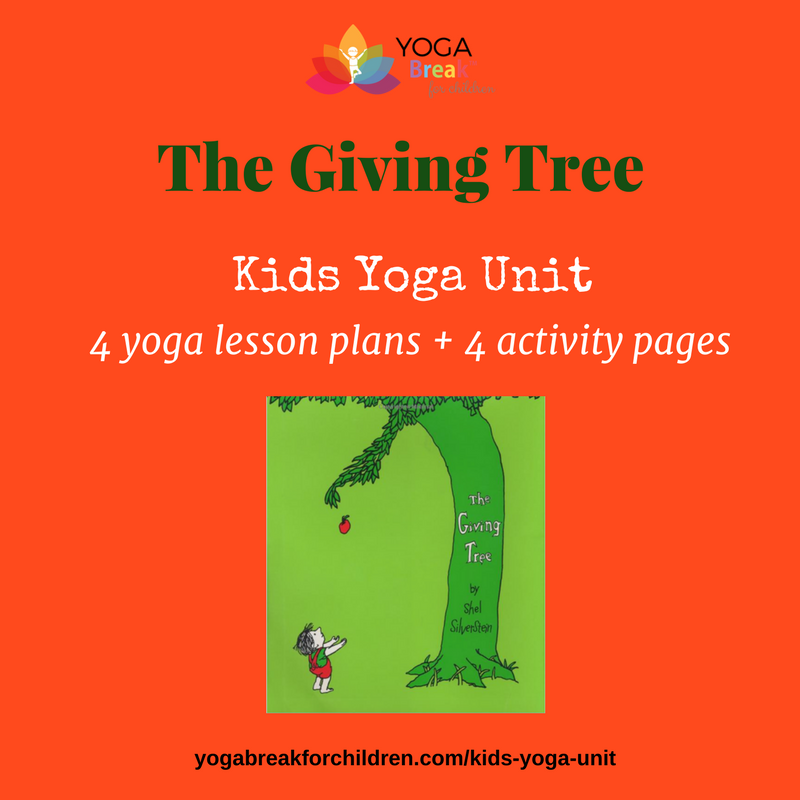 Giving and Receiving are two important virtues that are explored in THE GIVING TREE Kids Yoga Unit. How and why do we give? Why is it important? Through literature, a yoga pose sequence, breathing exercises, meditation and a meaningful game you will teach kids about being generous and taking care of other people. This unit is perfect for December's holiday season when we give and receive gifts. Using activities in The Giving Tree unit, you will explore the true meaning of the holiday season. The unit includes 4 yoga lesson plans, 4 student handouts, a unit outline and music suggestions. 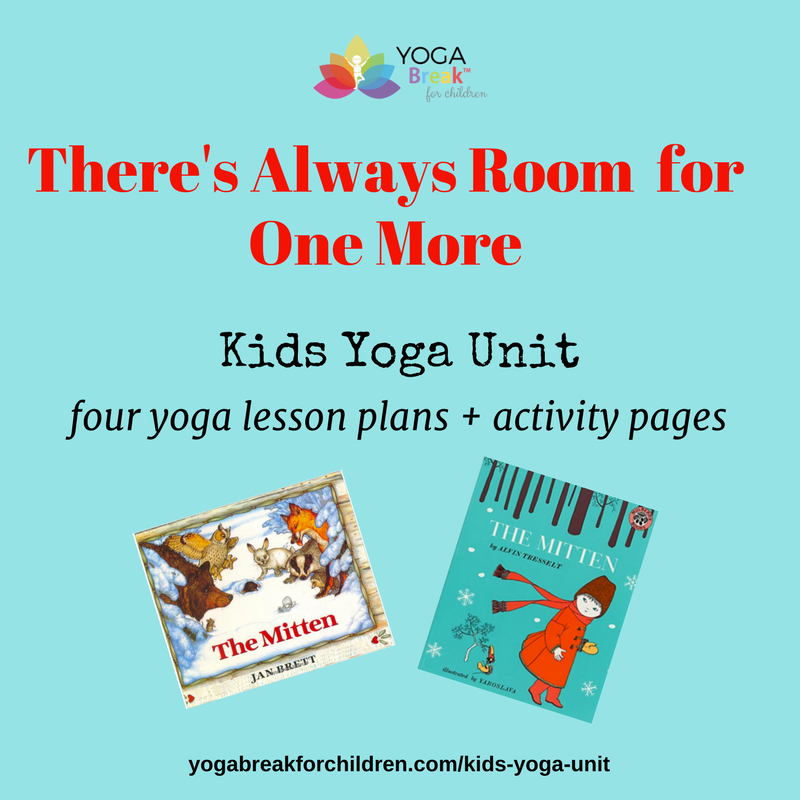 This Kids Yoga Unit was inspired by a Ukranian folk tale 'The Mitten'. In the THERE'S ALWAYS ROOM FOR ONE MORE Unit, your students will learn about winter animals and how to be kind, accepting and inclusive. Animal yoga poses are very popular among kids and in this unit, you will have plenty of opportunities to enjoy them. Using literature, a yoga pose sequence, breath work, meditation, a yoga game and an art activity you will have everything you need to teach four weekly kids yoga classes. The unit includes 4 yoga lesson plans, 4 students handouts, a unit outline and music suggestions. In February we celebrate Valentines Day. It is a perfect opportunity to educate kids about the feelings and emotions that they deal with on an everyday basis. Learning about feelings is important. It promotes children's social and emotional well-being, helps them better express themselves and establish positive relationships. 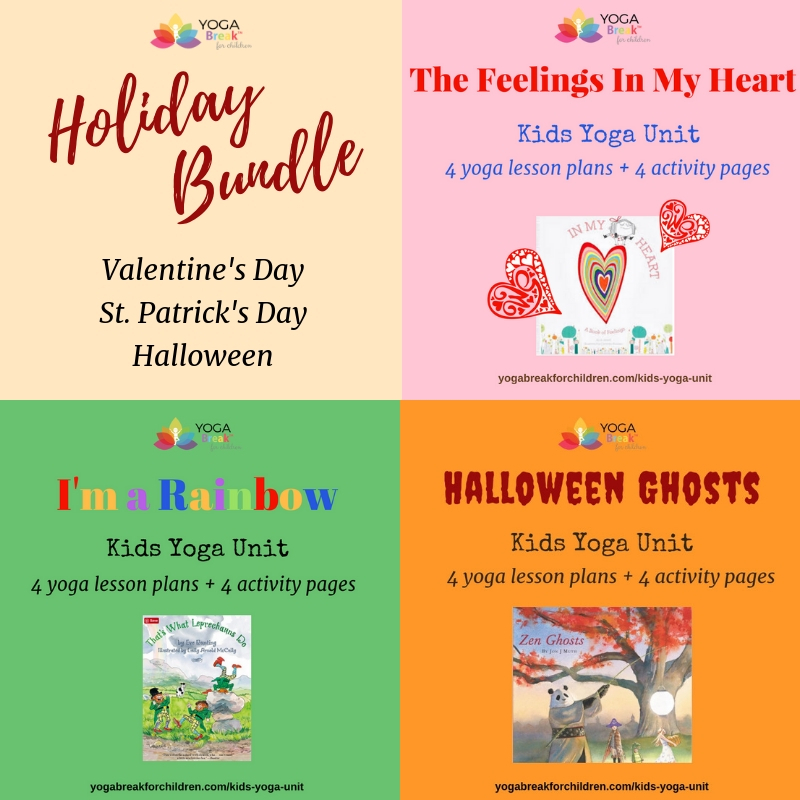 In the THE FEELINGS IN MY HEART Kids Yoga Unit, you will use literature, yoga poses, breath work, meditation, a game, music and art to teach your students about different feelings and how to deal with them. The unit includes 4 yoga lesson plans, 4 students handouts, a unit outline and music suggestions. We all have a rainbow inside of us! Different combinations of colours, qualities and characteristics make us unique. The I'M A RAINBOW Kids Yoga Unit introduces the concept of chakras in a kid-friendly, age-appropriate and universal way. An original song, written especially for this unit, will provide you with a chance to sing or chant affirmations and do yoga poses along the way. You can also use a breathing technique, meditation, a game and an art activity to expand on the idea that we all are different and unique. If you celebrate St.Patrick's Day then this unit is perfect to teach holiday-themed kids yoga classes. The unit includes 4 yoga lesson plans, 4 student handouts, a unit outline and music suggestions. In April we celebrate Earth Day. 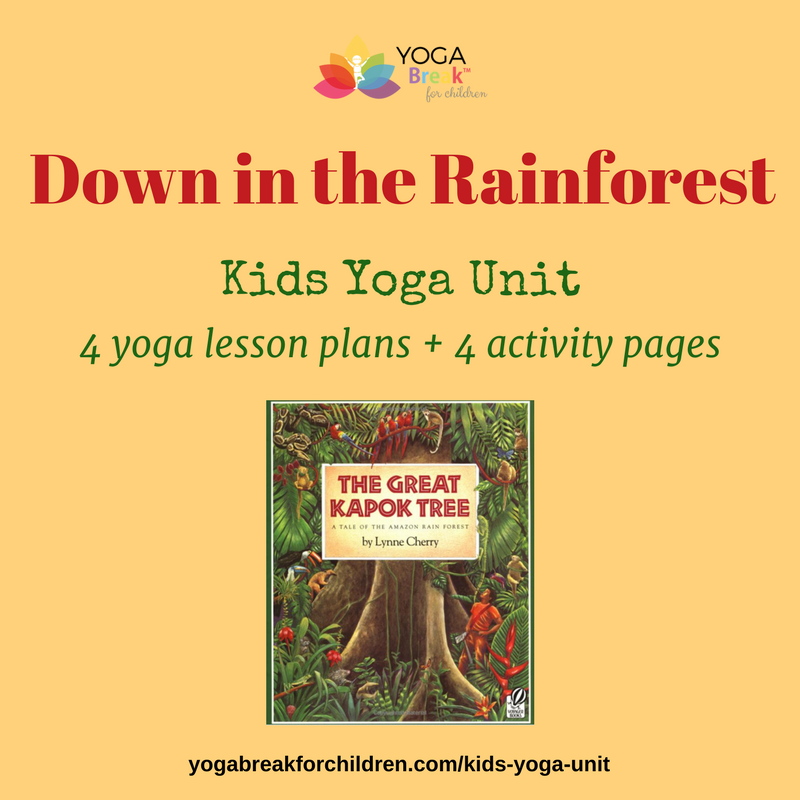 The DOWN IN THE RAINFOREST Kids Yoga Unit provides everything you need to teach Earth-Day themed kids yoga classes. The rainforest is one of the incredible treasures that our planet has! And it is in danger! Using the DOWN IN THE RAINFOREST Unit you will educate your students about the importance of rainforests. This unit is filled with animal yoga poses, breathing exercises, a meditation, a game and an art activity. Enjoy fun yoga and learn about rainforest animals, trees, plants and how we can take care of them. The unit includes 4 yoga lesson plans, 4 student handouts, a unit outline and music suggestions. May is the time when flowers grow and trees bloom. Help your students learn about plants and how they grow. 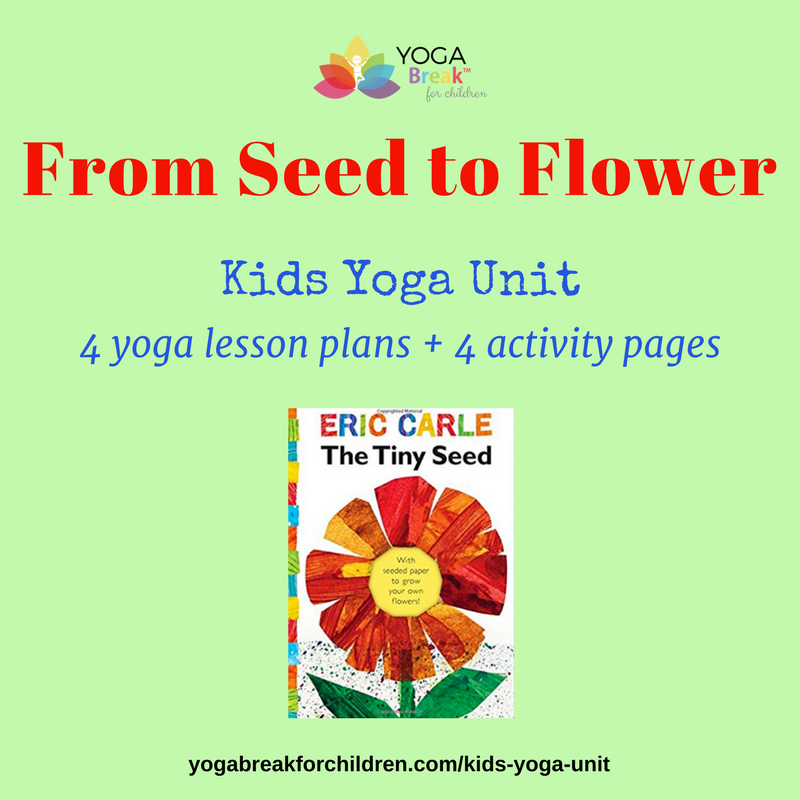 The FROM SEED TO FLOWER Kids Yoga Unit was specifically designed to teach about plants and is perfect for spring and summer yoga classes. Do a yoga pose sequence with an original song, learn a helpful breathing exercise, meditate and experience a hands-on activity by planting seeds and watching them grow. As always, there is a fun game, music and celebration! The unit includes 4 yoga lesson plans, 4 student handouts, a unit outline and music suggestions. Insect yoga anyone? 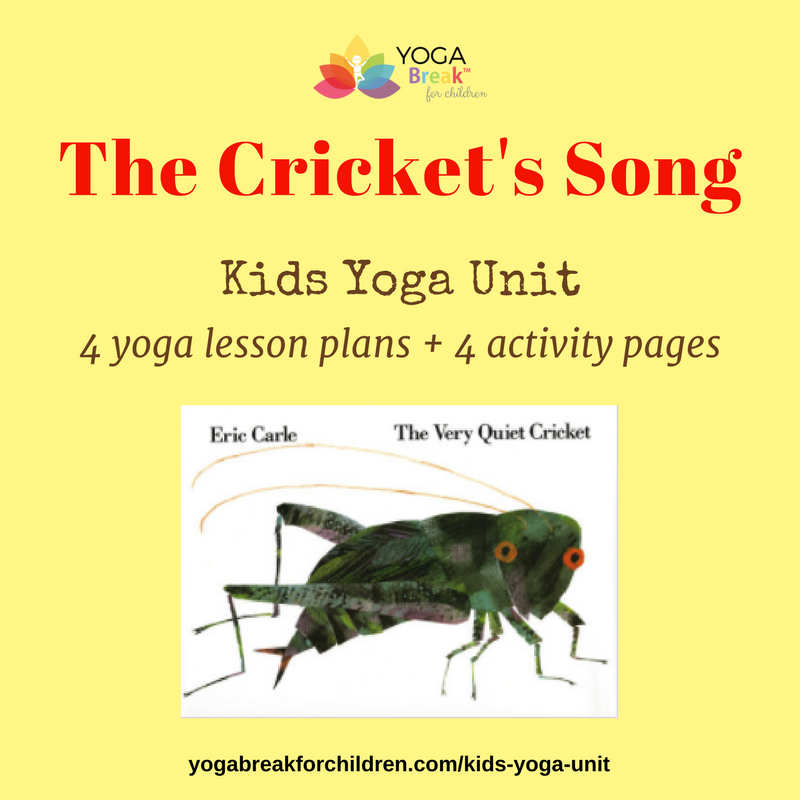 The THE CRICKET'S SONG Kids Yoga Unit is full of insect yoga poses which kids are very excited about. There is also an insect breathing exercise and a sound meditation. A dynamic and fun song was specifically written for the sequence in this unit and will add a unique twist to your yoga practice. Your students also will be surprised to see what hands-on activity you prepared for them and will love a fun game. Summer nights with beautiful cricket songs will never be the same after doing yoga and yoga-inspired activities of this unit. The unit includes 4 yoga lesson plans, 4 student handouts, a unit outline and music suggestions. 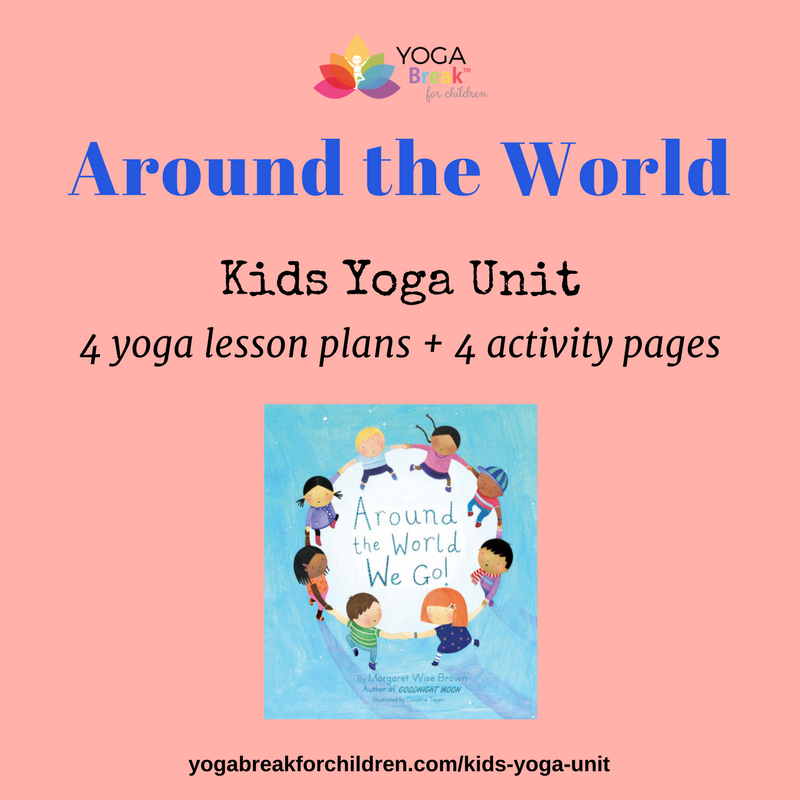 The AROUND THE WORLD Kids Yoga Unit is perfect for the time of summer travels, but you can also teach it any time of the year and learn about the different countries of the world. Use it for multicultural events, to teach diversity or promote feelings of acceptance and inclusiveness. The unit is full of fun yoga poses based on places, people and traditions from around the world. You will also do a breathing exercise, visualization, game, song and an art activity which will take you on an around the world adventure. The unit includes 4 yoga lesson plans, 4 student handouts, a unit outline and music suggestions. You know how fascinated kids are by sea creatures?! Summertime is perfect to explore sea or ocean themes with kids. 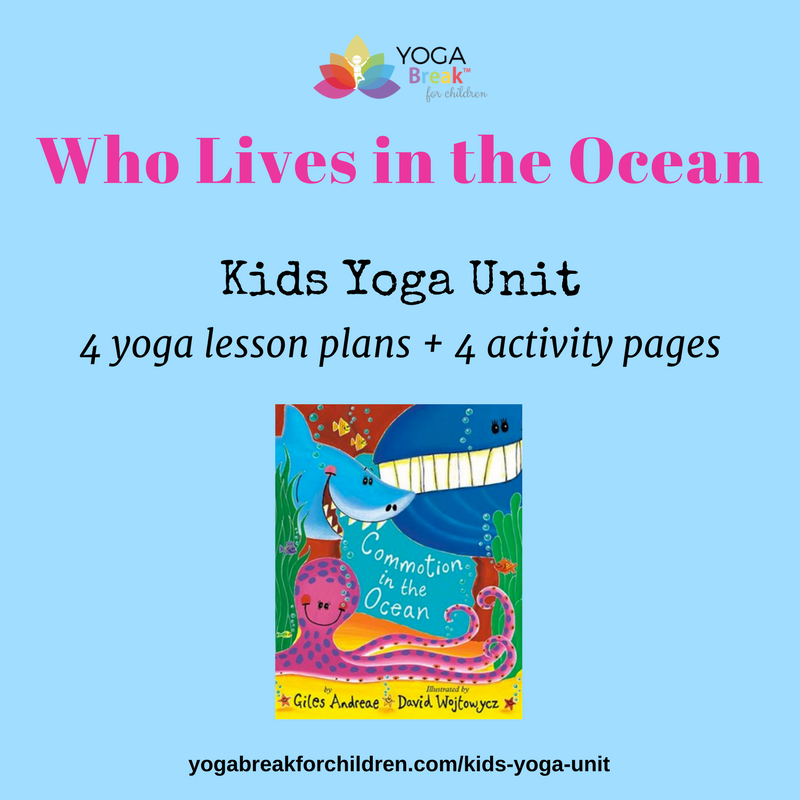 In the WHO LIVES IN THE OCEAN Kids Yoga Unit, you can expand children's knowledge about sea and ocean animals and make it a great summer activity. The unit is filled with a sea animal yoga pose sequence, breathing exercise, visualization, yoga game, song and a fun art activity. Enjoy doing this unit on the beach, in summer camps or retreats. The unit includes 4 yoga lesson plans, 4 student handouts, a unit outline and music suggestions. We all would like to see our kids being kind to themselves and the people around them. In September, kids go back to school and meet new people. It's an exciting time for them to make new friends and practice being kind, accepting, patient and inclusive. 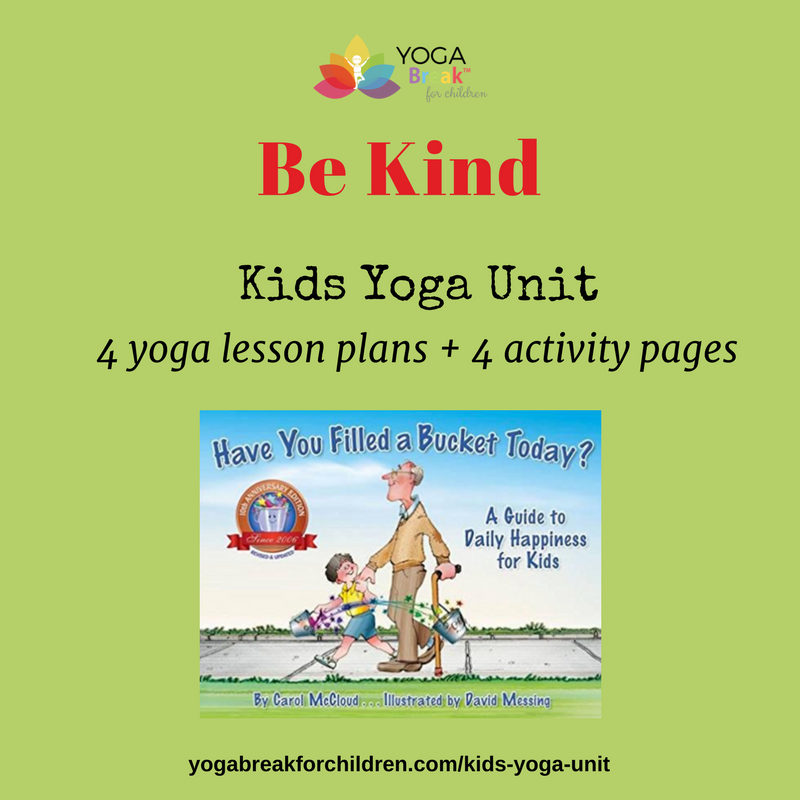 The BE KIND Kids Yoga Unit is filled with a partner yoga sequence, a breathing technique, kindness meditation, a game and a fun art activity to promote kindness and respect towards ourselves and others. The Be Kind unit is a great resource to have when teaching anti-bullying in schools, camps or yoga classes. The unit includes 4 yoga lesson plans, 4 student handouts, a unit outline and music suggestions. 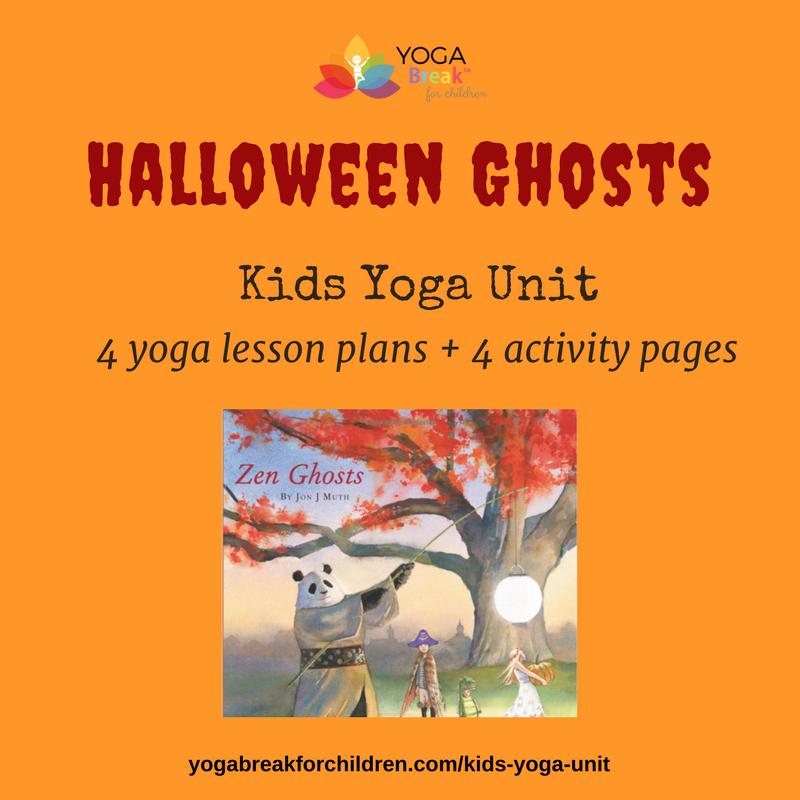 Celebrate Halloween with the HALLOWEEN GHOSTS kids yoga unit! Teach your students the Halloween Yoga Pose Sequence, Ghost Breath, and invite them to experience My Reflection Visualization. Play a Partner Yoga Game and create Halloween Art that is not just fun to do, but also smoothly integrates into the school curriculum and explores mathematical concepts. In this unit, you will also introduce your students to the concept of duality. You will have a chance to explore what's real and what's illusionary in the world around us. The unit includes 4 yoga lesson plans, 4 student handouts, a unit outline and music suggestions. Thanksgiving is for Thankfulness! In the BE THANKFUL Kids Yoga Unit, we explore the concept of being thankful. Through the yoga pose sequence, Thankful Breath, I'm Thankful visualization, creating a mandala and playing a Thankful Circle yoga game, children learn about what it means to be thankful and deepen their appreciation of all the blessings they experience in their lives. 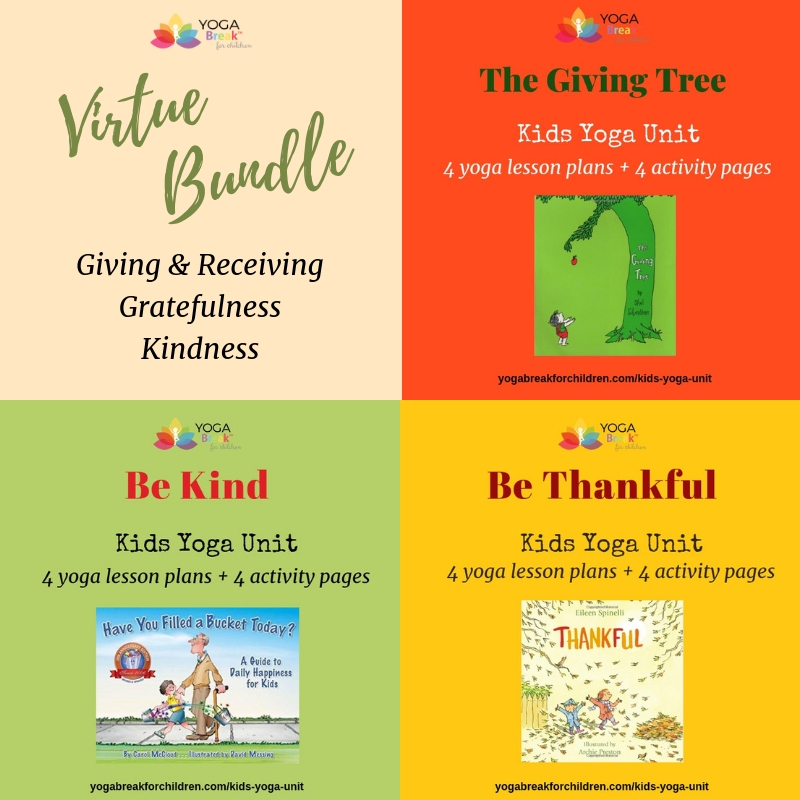 Though it's great to use this unit for your Thanksgiving kids yoga classes, you can also teach it at any time of the year and educate your students about gratitude and thankfulness. The unit includes 4 yoga lesson plans, 4 student handouts, a unit outline and music suggestions. I am truly thankful for your Kids Yoga Units and Lessons. 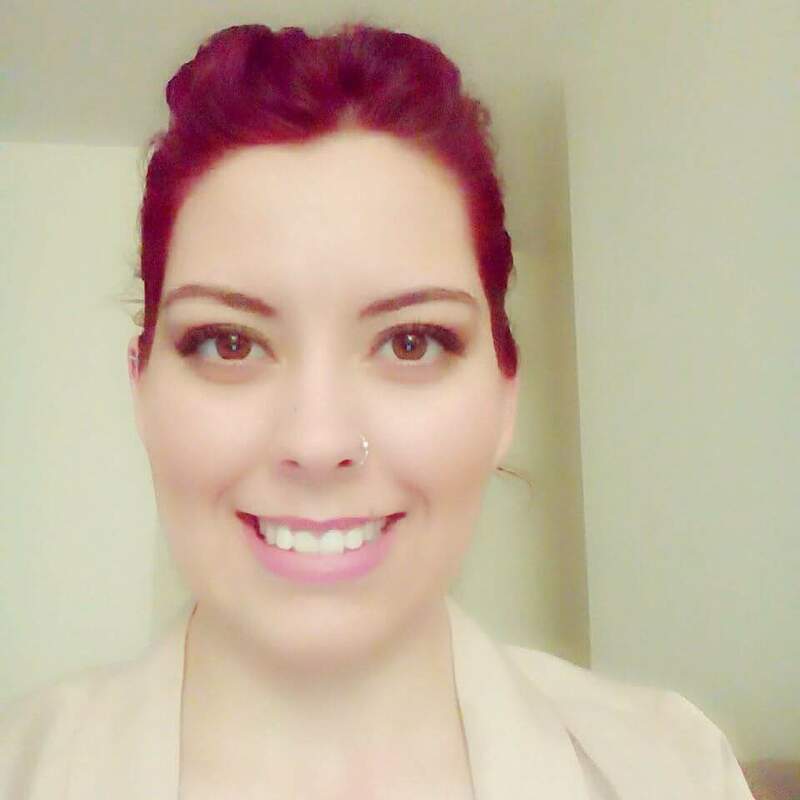 I am a new yoga teacher and find them to be amazing and very helpful. My children enjoyed them very much. Thank you for sharing it! Much love! Stock up on all 12 Kids Yoga Units and save! These 12 Monthly Kids Yoga Units are for children's yoga teachers, educators, parents or anyone doing yoga with children. 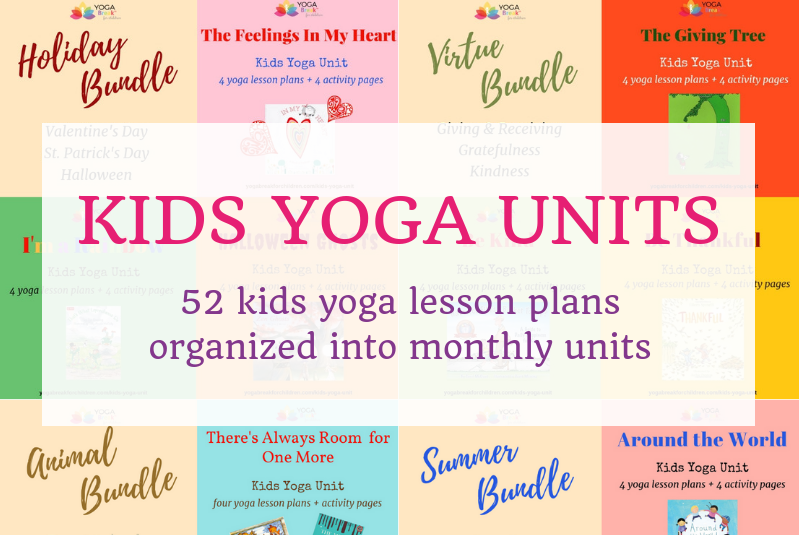 When you purchase all 12 Monthly Kids Yoga Units, you will receive 48 lesson plans, 48 activity pages and 12 unit overviews. An original song related to the unit's theme to address different learning styles and make it fun. These resources will provide you with everything you need to teach the FULL YEAR of kids yoga classes. My goal is to make it easier for you to teach children’s yoga! I want you to use and enjoy the lesson plans that I designed to save time and deliver creative, educational and fun kids yoga classes! I also want to enable you to plan your own lessons using whatever themes, topics and inspiration you get. When you buy all 12 Monthly Kids Yoga Units, you will receive these two amazing BONUSES! In addition to done-for-you lesson plans and worksheets I wanted to share with you my system of how to design children’s yoga classes for the best learning experience. 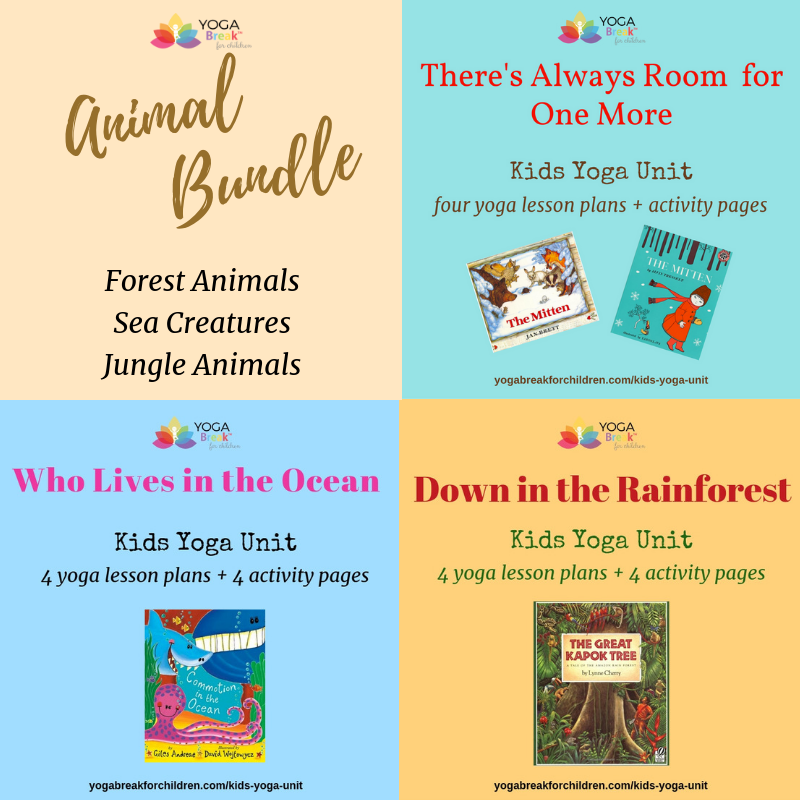 By receiving the ready-to-use kids yoga lesson plans and knowing how to plan and structure an individual class you will be able to create many great lessons. I also would love to share with you how to arrange these single lessons into a progressive Kids Yoga Unit. By teaching your yoga classes in thematic units, you will give the children plenty of opportunities to learn the yoga practices you are teaching, memorize, embody and apply them in their everyday life outside of the yoga class. 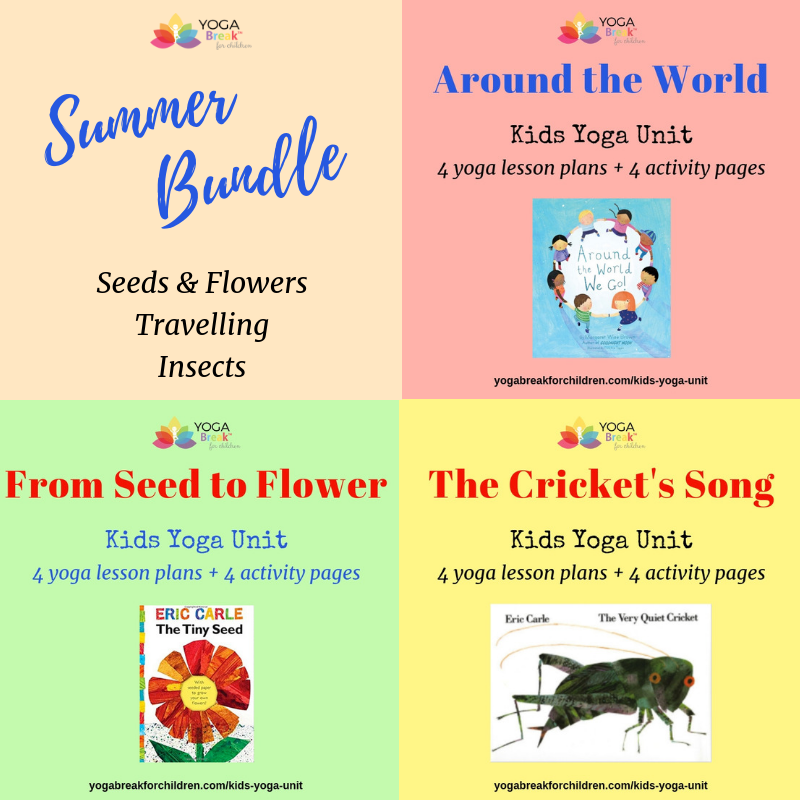 Equipped with ready-to-use kids yoga lesson plans, student handouts and the training on how to design yoga classes and units, you will be fully prepared to teach great kids yoga classes week after week! No more searching for ideas and wondering what to teach this week! No more hours of preparing and planning! Let me plan and you enjoy and have fun teaching kids yoga! Once you click the button above, you'll be taken to our secure checkout. After your registration is complete, you'll be sent an email receipt. You also will be sent a link to login on the online platform where you can start setting up your profile. 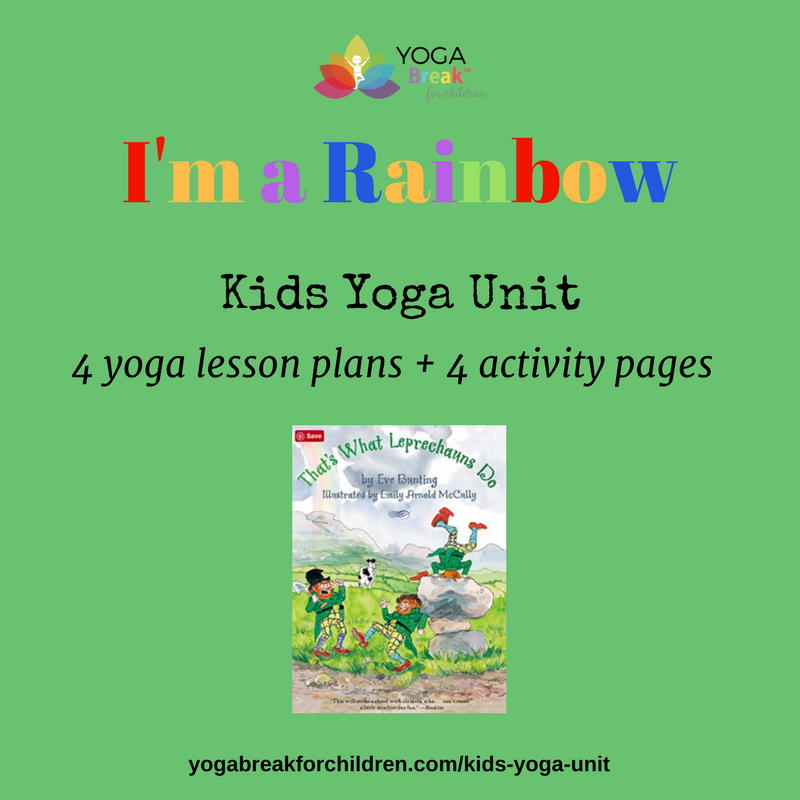 You can go through the Introduction Lesson on how to use the portal, watch a Welcome Video and immidiately download your Monthly Kids Yoga Units and Bonuses (12 units purchase).